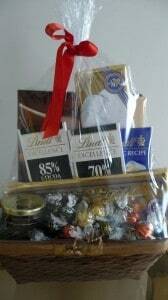 A huge Lindt chocolate gift basket full of goodies that I could.not.wait to rip into. Truffles, chocolate sauce, huge dark and milk chocolate bars, smaller dark chocolate and white chocolate bars, and… a cookbook! A cookbook full of chocolate recipes. This man certainly knows the way to this woman’s heart. These dark chocolate truffles were the first recipe that I tried from the book and as I expected, they were fabulous. 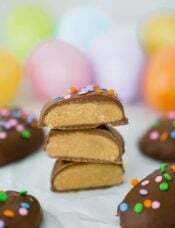 I always like to coat my chocolate truffles in chocolate, so I typically melt additional dark chocolate with 1 teaspoon of shortening per cup or 6 ounces of chocolate and dip each truffles and place on a wax paper-lined baking sheet. (The shortening thins the chocolate a bit and gives it a shiny finish when it dries. I use it anytime I dip something in chocolate.) Alternately, you could roll the truffles in cocoa powder, powdered sugar, coconut, chopped nuts, whatever you’d like! 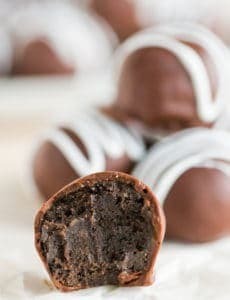 ♦ When you stir together the chopped chocolate and the cream, do not use a whisk, as it will incorporate air into the mixture and make the truffle filling crumbly instead of smooth. Be sure to use a rubber spatula to stir. 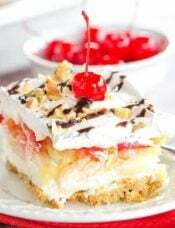 ♦ Make sure that the chocolate is chopped finely so that it melts evenly and completely in the cream. ♦ Ensure that the butter is at room temperature so that, again, it melts evenly and completely into the chocolate mixture. 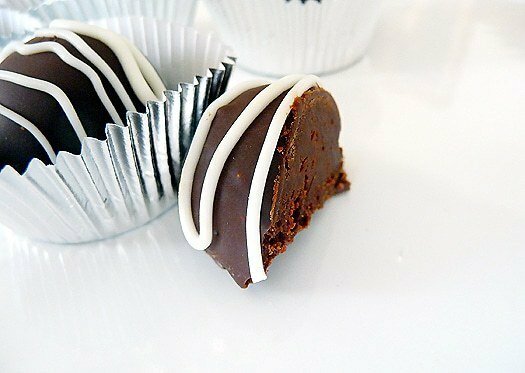 ♦ Work quickly with the ganache when shaping and dipping them, making sure that they do not get too warm and lose their shape. 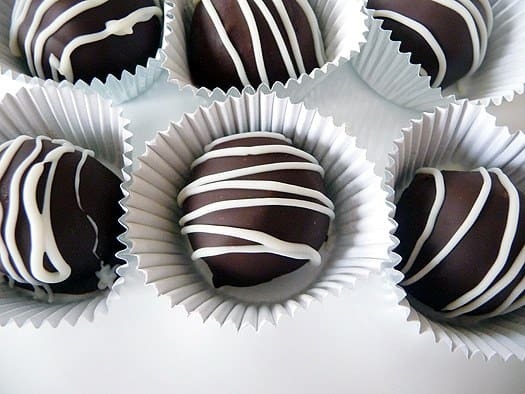 ♦ If you want to make rum, whiskey or any other alcohol-flavored truffles, replace 1-1/3 tablespoons of the cream with the liquor or brandy of your choice. 1. Heat the cream until it just comes to a boil, add the chopped chocolate, and remove the saucepan from the heat. 2. Stir the mixture with a rubber spatula until the chocolate is completely melted. 3. Stir in the butter until the ganache is smooth. 4. Put the ganache in a bowl and cover with plastic wrap, ensuring that the plastic makes contact with the entire surface of the ganache. 5. Refrigerate at least one hour (or overnight) until the ganache is set. 6. 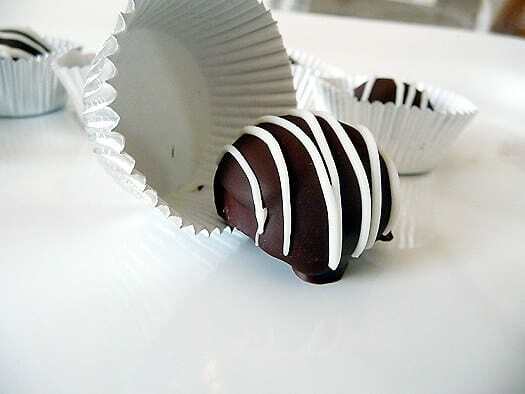 To form the truffles, use a melon baller to scoop the ganache into a ball and place on a wax paper-lined baking sheet. 7. Finish the truffles by dipping in your ingredient of choice. 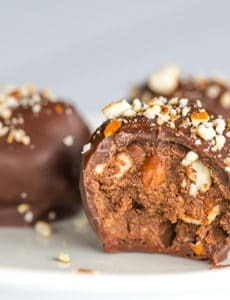 If dipping in chocolate, place the balls of ganace in the refrigerator or freezer for at least one hour or until thoroughly chilled before dipping. Love your blog!! Fellow Pittsburgher! 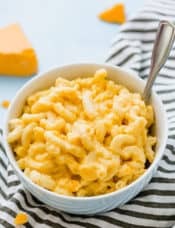 Are there any issues with doubling this recipe other than longer chill time??? Hey, how dark can you go on the chocolate? Is 85% too dark to have these turn out good? Hi Kristina, I think 85% would be fine. Enjoy! Thanks! Can’t wait to try them! By the way, may I kindly ask a question? I tried a second batch using Lindt Dark Choc 85% for my sis( she’s a dark chocolate lover). I did all the same steps except the fact that I boiled the cream a lil bit too much this time. Yet, the outcome turned out to be very different. The granache did not become smooth. It did not corporate well and became like small chunks. Does it because I boiled the cream too much or because the chocolate mass and ingredients in 85% dark chocolate? Thank you so much! 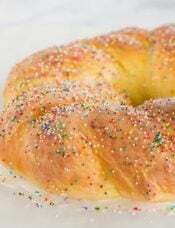 I absolutely love your blog and I also recommend friends to follow your recipe and tricks! Happy new year in advance! May your life be filled with happiness and joy!! Hi Pat, I’m so happy you enjoyed the truffles! The second batch may have been a combination of the higher cacao % (it is naturally not as smooth) and the cream boiling over. Yes…I think it was because of the cocao mass. My sis and I are dark chocolate lovers. So, we are so keen to have a bitter one. 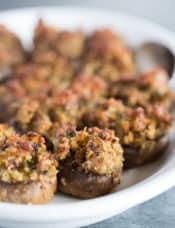 My friends really love these truffles and also ask to have the recipe! This is a very good one! :) Thank you so much for sharing all these! I am a big fan of dark chocolate truffles. 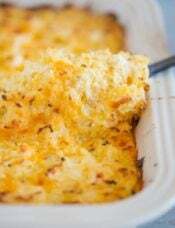 Thank you so much for providing the recipe of my favorite dish. Dark chocolate is very beneficial for our heart and blood. Every day after taking dinner, I used to eat dark chocolate. 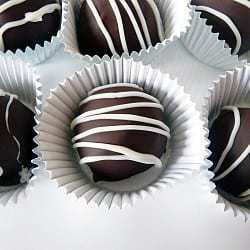 Now I will try these dark chocolate truffles.